From the 7th edition the red band was replaced with the yellow one shown. 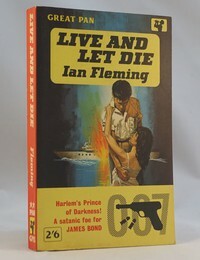 ​7th printing 1962. Pan GP83 to spine. Copies have been found with 2’6 printed to front cover, no price and with a 2’6 price label to the front. 9th printing 1963. Pan GP83 to spine. Copies have been found with 2’6 printed to front cover. Note the 9th printing is also found as part of Pan X233 series. The book looks very similar but the top of the front cover no longer says “Great Pan” and the Pan logo top right is redesigned to include X233.